Lesley Quilty and Sonia Crawford. Nice to see the days getting longer and the grass getting longer as spring beckons (well good for the farmer and maybe not so flash for the weekend lawn mowers). A whip around the clubs' websites indicates that apart form tournaments there hasn’t been much else happening on the radar… no significant milestones or achievements so it has been obviously heads down playing bridge and listening to the BridgeZone with Mereana and Barry. Over the past two months, the region’s three metropolitan events wrapped up. 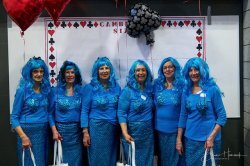 The 5A Bay Pairs held over four heats was won by the omnipresent Kate Terry and Judy Pawson from Tauranga while Matamata’s ubiquitous Lesley Quilty and Sonia Crawford survived and conquered the 6 heats in the Waikato Area Pairs to finish in top spot. 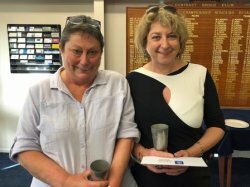 Lesley and Sonia celebrate in Morrinsville after winning the 5A Waikato Area Pairs: combined age 170 and I might be making this bit up but guessing over 100 years combined bridge experience! Over in Hamilton they held a 5A Swiss Pairs over three nights which was contested by 24 tables and won by Yuzhong Chen and Jenna Gibbons of Waikato/Hamilton clubs who grabbed the win ahead of Jenny Millington and Barry Jones. At all three events it was good to see a mix of grades and abilities in the room giving the contest a crack and, in many instances, punching above their weight. Metro events are a good way of providing a competition outside the clubs in a format that differs from the usual one day or two-day event. 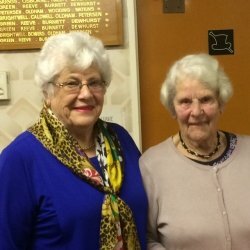 The WAP and Bay Pairs in particular are very social events that are low cost and welcoming to newer players on the circuit. Another initiative which we borrowed from Wellington and Auckland has been our TWITs competition – or The Waikato Interclub Teams, which has been played on Friday evenings once a month in Hamilton with the emphasis on fun and interclub spirit and wrapped up with the trophies going to Hamilton (Junior); Te Aroha (Intermediate) and Waikato (Open). 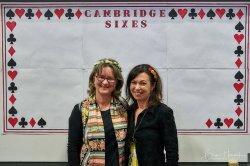 The biggest event on the Waikato bridge calendar is the Cambridge 6s. It really is quite a spectacular event which this year had 44 teams of 6 (66 tables!) participate for the 6th anniversary at the amazing Don Rowlands Centre on the banks of Lake Karapiro. 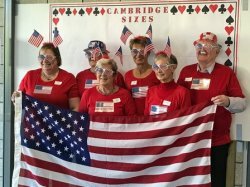 The event has snowballed from when it was first staged in the hall adjacent to Cambridge Bridge Club and has since outgrown two venues. The winning team hailed from Auckland and Mt Albert clubs who obviously missed the memo about dressing up! 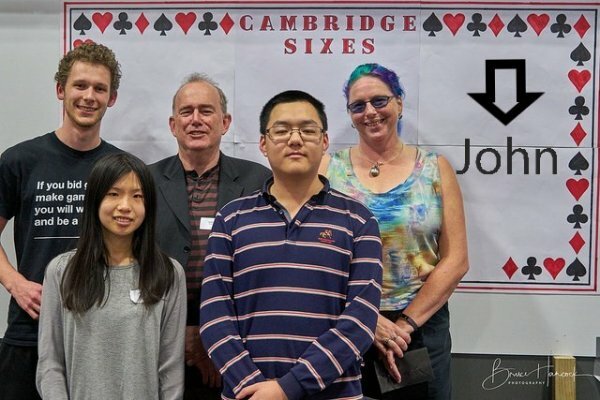 Well done from the back Jeremy Fraser-Hoskin, John Craig, Babs-Merel De Visser and the front Sheryl Luo and Tin Pan who were also took outright win in the Junior section. (Missing was John O’Connor but it was nice they left a space in the photo to presumably photo shop him in later if only I was a competent graphic designer). Back up a few weeks and the Matamata Open was held with a pretty strong field featuring many of the big names. 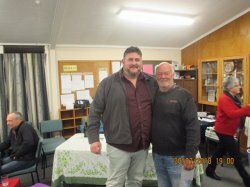 The winning combination was Mike Curry and Ken Yule from Auckland/Matamata over Russell Wilson and Patrick Carter from New Plymouth/Auckland. Russell travelled the furthest for the Matamata tournament and took advantage of the opportunity to be billeted by the Matamata President Beth Vosper who said Russell was the ultimate house guest! We sometimes forget that one of the best things about bridge is socialising and meeting new people and we should ensure that we are providing the option for people to billet when hosting a tournament. A great way to meet people, save a few $$ and hopefully be able to reciprocate when the opportunity arises. Matamata winners, Mike Curry and Ken Yule. Triumphing at Tauranga, Kathy Yule and Jo Simpson. Not to be outdone by her husband’s feats,Kathy Yule paired up with Jo Simpson to take out the Ladies Day tournament in Tauranga. Dear me … I’ve already surpassed the recommended 600 words for this column and haven’t even touched on the Intermediate and Junior tournaments as well as the results of the Waikato BOP grade teams…. Hamilton Junior Pairs: winners Leanne Curry and Megan Jolly from Hamilton (nb Leanne is looking to emulate her older brother Mike’s feats at the bridge table in a few years). 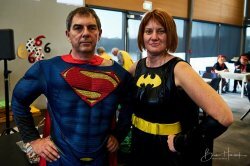 Tauranga Intermediate Pairs: Malcolm Kirkby and Eunice Eccles (Te Aroha/Cambridge) They are also coming top of the ladder in the Intermediate league with just two tournaments remaining. The top clubs from Waikato and Bay of Plenty met in Cambridge to contest for the top grade trophies. There is no longer a national top club event. So the victors battled for the trophy and of course pride. Waikato Bays Regional Committee also sponsors four players to Congress to the equivalent of the Intermediate package. It is open to anybody who has played regularly in tournaments and hasn’t been more than once to Congress in recent years. The winners were drawn at random and included a nice mix from around the region Terry Wells (Huntly), Leanne Curry (Hamilton), Jan Gyenge (Tauranga) and Beth Kingsley (Cambridge).